How does a city like Seattle manage a big civic welcome such as the Apollo 12 astronauts' visit tomorrow and Saturday when it has neither an official greeter or a budget for entertaining distinguished visitors? Luckily we have a few gung-ho guys who give generously of their time and talent, a handful of civic-minded citizens who dig deep and often to pay the bill and are willing to work like dogs rather than see their city embarrassed by anything that is second-rate or shoddy. And the key characters and story-behind-the-story of the Apollo 12 astronauts' Seattle visit is typical, more or less, of most civic welcomes here during the past 30 years. AS USUAL, it begins with John F. (Jack) Gordon, the holler guy and idea man behind most of the big civic re-ceptions. For many years (before he became executive vice president and general manager of the Restaurant Association of Washington), Gordon was the promotion dynamo behind Seattle's Seafair and chairman and master of ceremonies of the Wel-come Lane programs that greeted more than 300 troop transports and 750,000 re-turning soldiers from Korea. He also has been the cheer leader and sparkplug behind numerous other civic receptions and testimonial banquets. Jack is Seattle's answer to the late Grover A. Whalen, long New York City's official greeter. And, strangely enough, he is a very modest and self-effacing person. "Probably the most misunderstood guy in Seattle," his friends insist. "People seeing him with a microphone in hand sometimes figure him as a brash loudmouth, a carnival-type spieler running a flatboard and ham-wheel. "Actually," said a long-time friend, "Jack is fundamentally a rather shy person who naively believes that someday this town will come up to his expectations. He loves a parade and is intoxicated by the music and excitement." "Half the things that happen in Seattle wouldn't happen unless Jack suggested it," said Victor Rosellini, who is frequently the fall guy or victim of Gordon's unabashed generosity. "Take the Apollo 12 astronauts' Seattle visit, for instance. They wouldn't be coming here if Jack Gordon hadn't extended them an invitation. Nobody else would have done it." JACK GORDON first met his namesake, Richard F. Gordon, Jr., the Apollo 12 as-tronaut, when the astronaut visited here in November, 1966. Jack handled details for the three-day homecoming celebration. At that time, Astronaut Gordon already had walked in space and was scheduled to be a crew mem-ber on one of the early moon landings. Also, Jack Gordon had met the astronaut's mother, Mrs. Angela Gordon, then a teacher at Seattle's Sacred Heart Parochial School, and got to know her quite well both before and during her son's 1966 visit to Seattle and Poulsbo. Like most of us, Jack was fascinated by man's flight to the moon. In Seattle-born Richard Gordon, he felt there was a personal link to the City of Seattle. And just meeting the Apollo 12 astronauts, he reasoned, is the closest any of us ever will get to the moon. ABOUT A MONTH before the Apollo 12 moon flight, Gordon met with Floyd Miller, then mayor, and suggested they draft a letter to NASA via Senator Warren Magnuson, inviting the three astronauts (Charles Conrad, Jr., Alan L. Bean and Gordon) to visit Seattle whenever convenient after their moon flight. 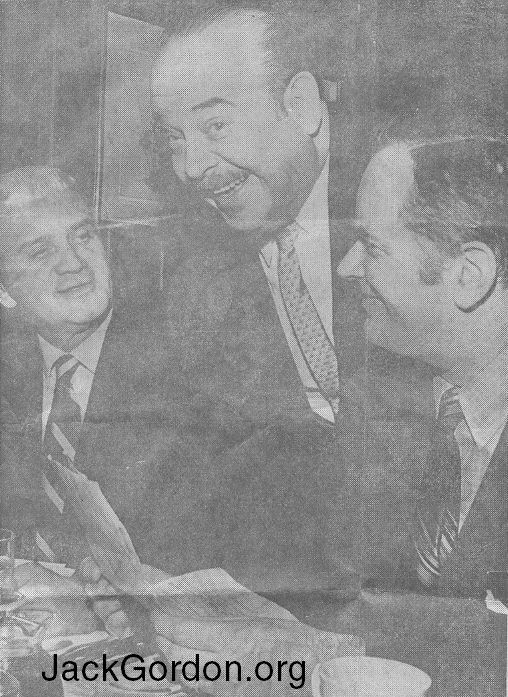 Since this was prior to the mayoral election, Gordon also conferred with both mayoral candidates, Wes Uhlman and Mort Frayn, advising them of the invitation and explaining what already had been done. Recently, the mayor's office received an unexpected phone call from NASA accepting the Seattle invitation. "Frankly," said Gordon. "we didn't expect them so soon. But it was a spin-off from the Rose Bowl. Since they were going to be in Pas-adena for the Michigan U. S. C. game, the astronauts would fly north to Seattle and arrive here Friday noon." This put "Seattle Salutes the Apollo 12 Astronauts Testimonial Banquet" up against the big Seattle U-Washington basketball game tomorrow night in the Coliseum (and Jack Gordon is an avid Seattle U. fan, plus having been awarded the school's prestigious Distinguished Alumni Service Award earlier last year). ALSO, IT meant that hard-working members of the volunteer committee would have to spend most of the Christmas and New Year holidays working on the civic reception. As usual. Jack recruited good guys such as Mel Anderson and Bill Sears to work on the publicity and planning. The Seattle Chamber of Commerce, City of Seattle and Greater Seattle, Inc., agreed to co-sponsor the big civic banquet in the Grand Ballroom of the Olympic Hotel. Within 72 hours, the $15-a-plate dinner virtually was sold out—thanks to hard-working guys such as James G. McCurdy, president of the Chamber of Commerce, and Jack Geoffroy, the chamber's executive secretary; C. M. (Mike) Berry and Arden Aegerter, president and manager, respectively, of Greater Seattle; Edward E. Carlson, chairman of the board of Western Hotels International, and Norm Lavin, the Olympic Hotel's catering manager; Dave Wood of the mayor's office, and a host of others. Vic Rosellini agreed to host a brunch Saturday fore-noon in his Four-10 Restaurant for the visiting astronauts and Senator and Mrs. Magnuson, plus other dignitaries and 170 or more invited guests, including 20 or more high-school editors. I ATTENDED a preliminary planning session with Gordon, Anderson and Rosellini prior to the final "shape-up" and came away dizzy from the split-second timing and almost unbelievable details that must be ironed out beforehand. These arrangements include everything from security to protocol, the pecking order of dignitaries in the motorcade from Boeing Field to the civic Welcome at the Public Safety Building Plaza and parade north in (sic) Fourth Avenue to the Monorail terminal, thence by Monorail to the Seattle Center's public welcome. But, as usual, there are others hard-working to see that the job gets done. They include Ralph Grossman, Louis Larsen, Police Maj. Henry Schultheis, Bruce Johnson, Bob Richardson, Jim Hunter, Dr. Dixv Lee Ray, Jim Backstrom. And there are still others, including Bill Brado and Roger Ford, who will do the street decoration, and Beach Tay-lor, last of the billboard "snipers," who will put plac-ards on lamp posts along the parade route. And let's not forget Kristi Lee, Mary Powers, Corky Mortimer, Stephanie Slater [from the Restaurant Association] and other secretaries and typists who prepared the press handouts, even scrounged the necessary statiuonary and postage stamps "operation shoe string." As I say — a civic reception in Seattle is really an amazing operation. It's like 'something right out of Catch 22.